A man who is running a website helping men find "second wives" claims it benefits women as well. In the UK, polygamous marriages - where a person has more than one spouse - are only recognised if they took place in countries where they are legal. However, no UK laws stop unregistered religious ceremonies taking place. 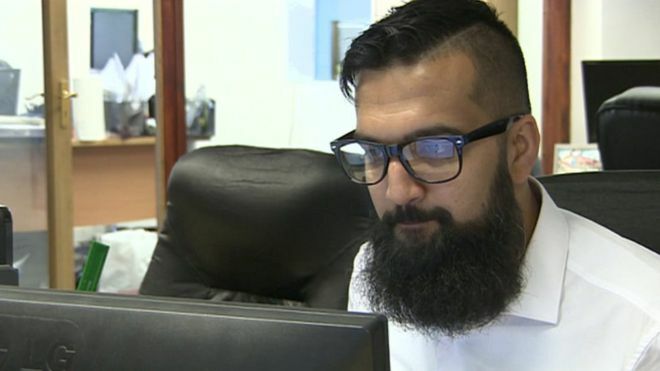 Azad Chaiwala told BBC Inside Out: "The second wife website came about from my need, and thinking there'll be other people in my situation." Most Muslims in the UK do not practise polygamy, but some interpretations of the Koran say that a man may marry two, three or four women, so long as he can deal justly and fairly with each of them. Mr Chaiwala, from Sunderland, said: "There are other deceiving ways of doing it - affairs, prostitution etc. - those are not necessarily good for relationships. He said 100,000 people had signed up - with men outnumbering women three to one - but denied it was something just for men. "It takes two hands to clap; a guy can't do it on his own," he said. "We've got so many successful marriages and so many women signed up themselves…they are opting to enter this kind of relationship." Mr Chaiwala said the whole idea was to build "bigger and better families" - but not everyone agrees. Prof Thom Brooks, dean of Durham Law School, said polygamy typically involved a husband choosing multiple wives, giving him "full control over who every single member of that family is". He said: "I think that as the country's trying to get a greater sense of equality, certainly trying to make steps towards gender equality, I think this is something which would be a stumbling block - this would be a setback." Tarek, a doctor from South Yorkshire, who does not wish to give his second name, signed up to the website. He said: "I found there were a lot of ladies who are growing old, or divorced, or single mothers, and nobody's really interested in them. "I thought 'well if I have the ability to manage more than one wife then I would like to have this opportunity'. "I'm not just doing it to have, I'm doing it to give." Image caption Tracy says Tarek is "physically a part-time husband, emotionally a full-time one"
Tracy, his "second wife", said: "I thought long and hard about polygamy and I thought 'well, OK, this could actually work out to my advantage'. "I want to be married to somebody but I still want to be able to travel and have my independence." However, she admitted it was not always easy and has asked to renegotiate the written marriage contract from one day a week to two. "I do think about my co-wife, they've got another child coming along, she does need more support," she said. "I've found myself being more insecure... it's really affecting me. "As much as I really love Tarek, I wouldn't do it again, because it's not easy emotionally, it really isn't." Tarek said: "It's up to the man, as wise as he could be, to treat them fairly and kindly and caringly. "The woman has the choice. She can walk away from the 'marriage' at any point." The full report is on BBC Inside Out in the North East & Cumbria and Yorkshire & Humberside at 19:30 BST on Monday 23 October and afterwards on the iPlayer. 0 Response to "Sunderland businessman's second wife website 'benefits women'"